I’ve been very busy working on various crafts as gifts for others and learning tools for Caleb since November. I have been mostly diligent photographing them, but I’ve been terrible at sharing them on my blog (or keeping up with blogging at all!). So, I’m hoping to backtrack for awhile while I share what I’ve been up to. 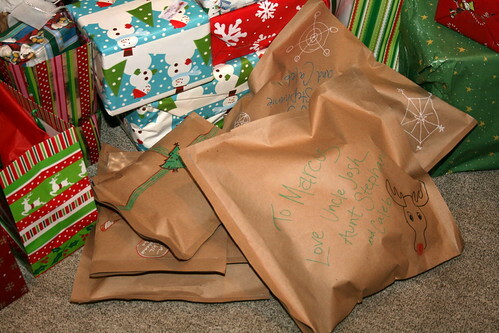 First, I would like to share how we have been wrapping gifts as of late. I got frustrated with the price of wrapping paper and also thought I could do something much more interesting. So, I got this giant roll of brown paper for like $8 at Home Depot. It’s in the paint section with the drop cloths. 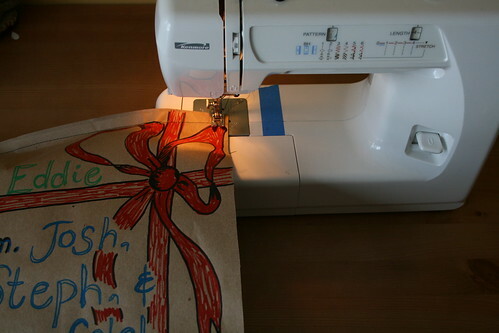 Then, I would cut a folded piece large enough to accommodate the gift I was wrapping, decorate it with paint pens, and then using my sewing machine to sew around the edges. Here is one we wrapped for Eddie. 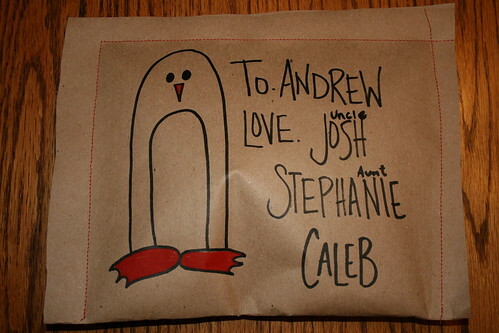 I tried to have my drawings give a hint as to what was inside. We got Eddie a doormat made of recycled flip-flops. I also alluded to my favorite comment by a student ever, “Art can be beautiful or ugly. It can be beautiful like flowers in a field, or ugly like a hairy man leg.” So, I guess you can call this art. Josh loved this one, for our nephew Andrew. I think some people thought we were weird (and possibly thought we were really cheap!) for wrapping gifts in this way. I think several were also confused, like, “How do I open this?? 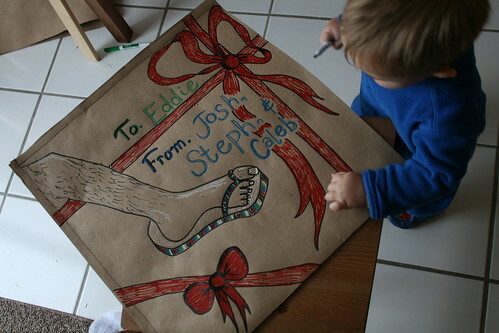 ?” But, I think it was more fun to do, more personalized, and much cheaper than buying wrapping paper! Plus, Caleb had fun watching me and “helping” me draw them all. Sometimes I would ask him what to draw and he’d say “Ella!” so then I’d draw a festive Ella as the decoration. What fun! 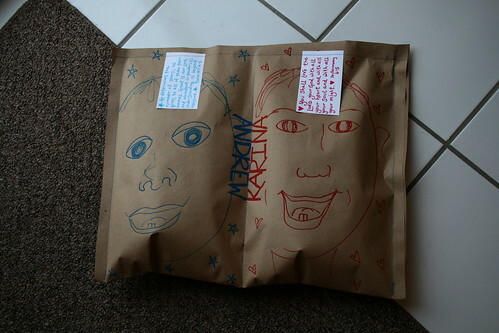 This is the wrapped gift I made for twins, Andrew and Karina. It was fun to give them one package with two compartments. I also sewed Bible verses to each side that correspond with the gifts inside.